SysInfo OST to PST Converter - Are you looking for free and best solution to export OST to PST format? Then download SysInfo OST to PST Converter that can convert as well as recovers corrupt OST files into PST and into another popular format like MSG, DBX, EML, MBOX ;amp Archive. SysInfo provides you with the best OST to PST Converter to migrate/export/ convert OST file to PST of Microsoft Outlook. Besides email conversion, the software is built-in with the features to handle corrupt and inaccessible data and restore Outlook OST to PST format hassle free. It gives the users the facility with three scanning modes; Standard, Advanced and Deep to handle the level of corruption in the Outlook OST files. If the user is facing highly corrupted OST cases then they are recommended to go with the Deep Mode to perform the recovery of OST files which can recover maximum possible data from corrupt OST files. While scanning any OST file the application handles alignment errors and encryption over the OST file. It does not require any technical knowledge to work on the software as it automatically does it work smoothly. 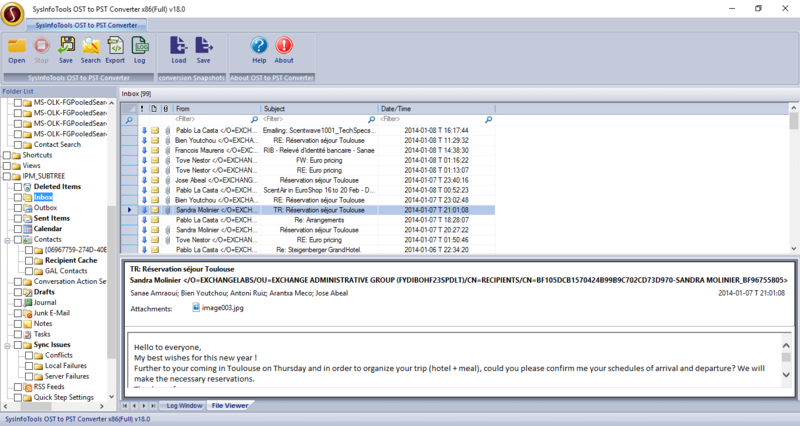 Other prime features of OST to PST Converter; Maintain the folder hierarchy in export from OST to PST; Support recovery of ANSI and Unicode characters; Perform conversion of all Outlook mail items like email, task, calendar, contacts, distribution group, and etc or OST file into PST without any troubles; Embedded with the feature to save recovered mailbox content into multiple file formats which includes PST, MSG, DBX, EML, MBOX, and Archive; Date Range Selection feature helps the user to save the OST data with the desired date as PST; OST to PST Converter Software provides a Log saving feature which saves all the scanning process in the form of TXT format for future reference; Three Scanning modes, Standard, Advanced and Deep Mode to handle different level of corruption if users have damaged or corrupted OST files; Compatible with every Windows OS from WIndows 10 to Vista or 2000 ;amp Latest versions of Microsoft Outlook.